Using the Resample dialog, a sample’s playback frequency can be changed without altering its pitch. This option can be applied to sample selections as well, but compared to the unselected audio material, the selection’s playback speed will be changed, while the sample frequency remains unchanged. The Resample dialog can be called from the Sample editor. Using the first two radio buttons, you can quickly either double (upsample) or halve (downsample) the sample rate. Otherwise, you may also specify a custom target sample rate by entering it into the input field. Filter: Lets you choose the interpolation filter to be applied while resampling. 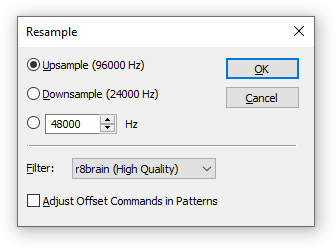 In addition to OpenMPT’s built-in filters (which are the same as those used for regular sample playback), there is also the r8brain resampler (default), which offers very high quality sample rate conversions. The default resampler uses Voxengo r8brain for sample rate conversion. This page was last edited on 7 July 2016, at 18:16.